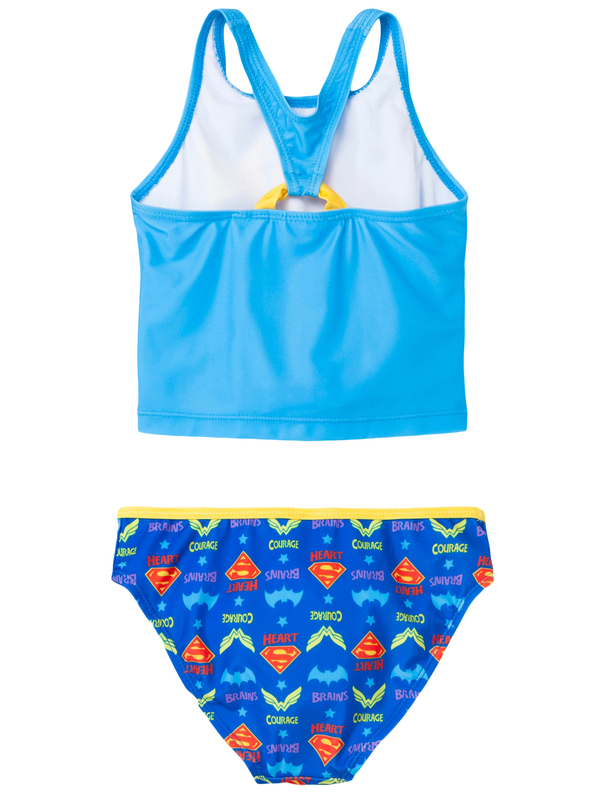 Just like her, Supergirl, Wonder Woman and Batgirl complement each other's qualities on this DC's Superhero girls 2-piece bathing swimsuit with UPF50+ protection. DC Superhero Girls Supergirl Batgirl Wonder Woman 2-Piece Swimsuit in Blue. Top the three superhero girls with logos graphic print and text "Brains, Heart, Courage" on the front. Bottoms feature all-over logos print. Cut-out straps on back. UPF50+ Excellent UV protection. 86% Polyester, 14% Spandex. For girls ages 4-7. Runs small. Officially Licensed DC Comics Apparel. Final sale. No returns on swimsuits. • DC Superhero Girls Supergirl Batgirl Wonder Woman 2-Piece Swimsuit in Blue. Top the three superhero girls with logos graphic print and text "Brains, Heart, Courage" on the front. Bottoms feature all-over logos print. Cut-out straps on back. UPF50+ Excellent UV protection. 86% Polyester, 14% Spandex. For girls ages 4-7. Runs small. Officially Licensed DC Comics Apparel. Final sale. No returns on swimsuits.